Show I am going to: "I'm on my way right now to go see Custo Barcelona. I'm also really looking forward to the Belstaff show." I am wearing: "I'm wearing Cynthia Rowley pants, one of a kind sample shoes that I don't know the designer, a Helena + Troy bag, my brother's shirt, and an Ashley B coat." What I do: "I work in retail right now at Alfred Dunhill." Show I am going to: "We're going to be seeing Tracy Reese right now." I am wearing: "I'm wearing my friend Ivy Thompson's collection which is called Byzantine, the bag is American Apparel, the shoes are Vince Camuto, and the necklace is from Etsy." My style: "I'm pretty Bohemian and I do a lot of flowy stuff but in the winter I try to keep it clean and get a cute coat." What I do: "I'm an Assistant Buyer at Macys.com." Show I am going to: "I am here to see Tracy Reese. I think this is the last show I'll be seeing by I've already seen Rebecca Taylor and Herve Leger." I am wearing: "I've got on Dolce Vita shoes, Levi jeans, Equipment shirt, vintage vest, and a REISS jacket." My style: "I'd honestly have to say manly but with some fun and easy touches. My favorite piece I have on is my vest which is my Great Aunt's." What I do: "I'm a fashion blogger and a digital marketing consultant." Show I am going to: "We were headed to Tracy Reese but I think we missed it. We're also looking to see Trina Turk and DVF later." I am wearing: "I'm wearing Phillip Lim shoes, Alice + Olivia Pants, Tibi sweater, Lulu Frost necklace, Zara jacket, Rebecca Minkoff bag, and my bracelets are Madewell." My style: "A little quirky, feminine, and with a city edge." What I do: "I'm a design director at an ad agency and I also have a fashion blog." Show I am going to: "We're headed to see Trina Turk and Vivienne Tam." I am wearing: "The shoes are Alexander Wang, the blouse is also Alexander Wang, the jacket is Nifty Thrifty, the ring is Jennifer Fisher, the bag is Vintage, and my sunglasses were a gift." My style: "I feel like my style always changes with my mood; some days it can be more dark and grungy somewhat Rick Owens'y while other days it'll be more light-hearted and flowery. Usually I like to mix in a lot of vintage pieces with whatever I'm wearing." What I do: "I'm an accounting manager by day and a blogger by weekend." Show I am going to: "I'm looking forward to seeing Castello d'Oro." I am wearing: "The coat is Zara, the pants are Joe Fresh, the blouse is Gap, the belt is just some chain from a trimming store, the shoes are vintage from Harlem, and the socks are my boyfriend's. Oh and my bag is BCBG." My style: "I think it's definitely eclectic. I look at something and don't really care who it's by...for me it's all about comfort." What I do: "I'm an actress." Show I am going to: "We're on our way to see Trina Turk right now and then Emerson later. I saw Mara Hoffman yesterday and I am absolutely in love." I am wearing: "I'm wearing all Trina Turk right now actually." My style: "It's not about doing what the cliche is; it's about being little aspects and pops of individuality." What I do: "I blog." Show I am going to: "I just got here from DKNY. I'm going to see DVF now and later I'll be seeing Zac Posen." I am wearing: "The blazer is Zara, vintage dress, Urban Outfitters hat, Prada shoes, Chanel bag, Sarah Chloe necklace, and I'm reading the Grace Coddington Memoirs." My style: "Very eclectic. Some days I'm very straight laced like today and then after the snow I felt a little Bohemian vibe. I just love fashion and try to really not care too much about trends." What I do: "I'm a fashion blogger from Italy but I'm now here living in New York." 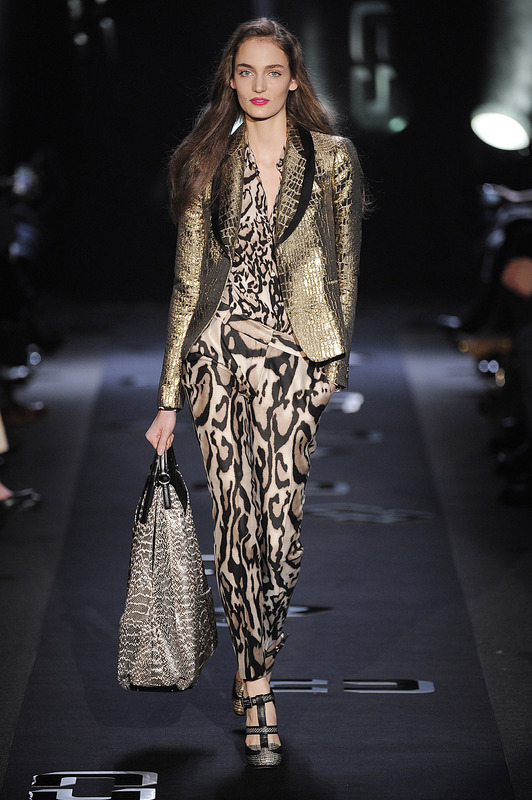 Show I am going to: "I'm on my way to see DVF right now. I'm really looking forward to seeing Milly on Wednesday." I am wearing: "The heels are Miu Miu, an H&M skirt, a Zara belt, and a Zara coat." My style: "A little bit romantic and feminine; I like bows and pearls." What I do: "I'm a fashion editor for a magazine in San Francisco." Show I am going to: "Today I'm seeing Vivienne Tam and Custo Barcelona." I am wearing: "The dress, jacket, and belt are all from H&M. As far as the rest the shoes are L.A.M.B., the bag is from BCBG, the watch is Michael Kors, the rings are from Forever 21, and the necklace was a gift from my boyfriend that he got in India." My style: "I like inexpensive items that still look like they could be high fashion; they always need to be fun and fashionable!" What I do: "I'm a journalist, a model, and a blogger from Spain." Show I am going to: "This morning I went to Delpozo and I really enjoyed it; for me it was the best so far. Now I am on my way to DVF." I am wearing: "I'm wearing Louboutin shoes, Tina Miller pants, Gap shirt, and Mink fur. The belt, bag, and jacket are from Mango." My style: "It's practical and warm; especially on days like today you need it." What I do: "I'm a stylist and a fashion blogger." Show I am going to: "I'm on my way right now to see DVF." I am wearing: "I'm wearing Cris Barros jacket, American Apparel hat, Zadig & Voltaire sunglasses, the boots are Miu Miu, and the ring is Eddie Borgo." My style: "My style is definitely fun." What I do: "I'm a stylist and a fashion correspondent." Show I am going to: "I just saw Trina Turk which was adorable; there were lots of hats which is fun." I am wearing: "The coat is vintage, the top is Hunter Dixon, the jeans are 7 For All Mankind, the boots are Calvin Klein, the sunglasses are The Row, and the necklace is Old Hollywood." My style: "I think that I tend to be pretty feminine without being girly. I also mix in some menswear pieces to and keep it a bit classic." With New York Fashion Week more than half way over, we could not be more excited to see what else is in store. In true Fashion Week style, Day 4 brought out some of our favorite everyday style looks yet! Maybe it was the clear skies and sunshine or maybe it was the incredible lineup of shows because the ladies of New York and beyond did not disappoint. Check out our picks for the 12 best dressed fashionistas from Day 4 of New York Fashion Week above.